1st printing. Collects Marvel 1602: New World (2005) #1-5. Written by GREG PAK. Art by GREG TOCCHINI. Cover by SERGIO TOPPI. Return to the world of 1602! Rising stars Greg Pak (X-MEN: PHOENIX -- ENDSONG) and Greg Tocchini (THOR: SON OF ASGARD) pick up where the best-selling story by Neil Gaiman left off: America, the New World! When Captain America was thrust back in time, it changed reality as we know it. 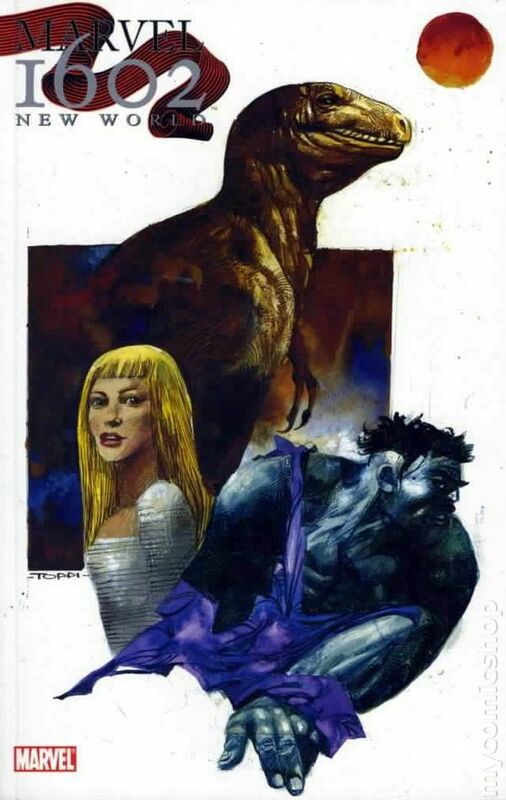 Dinosaurs still roam the earth, and the Marvel super heroes we know came to exist 500 years early. Witness David Bruce Banner and Peter Parquagh become the Hulk and Spider-Man in the most eagerly-awaited event of the year! Softcover, 128 pages, full color. Cover price $14.99. 1st printing. 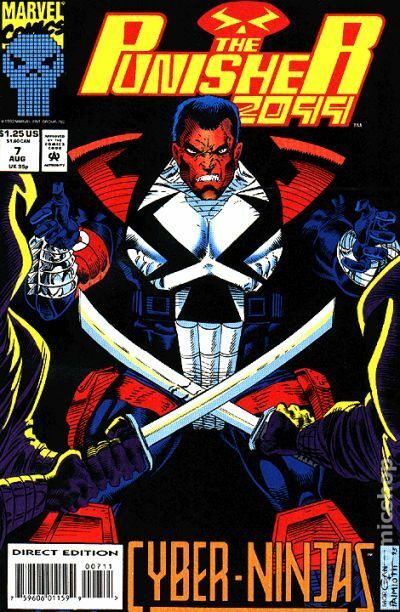 Collects Ghost Rider (1990-1998, 2007 2nd Series) #1, Deathlok (1990 Mini-Series) #1, New Warriors (1990-1996 1st Series) #1, Foolkiller (1990) #1, Darkhawk (1991-1995) #1, Sleepwalker (1991-1994) #1, X-Force (1991-2002 1st Series) #1, X-Factor (1986-1998 1st Series) #71, Warlock and the Infinity Watch (1992-1995) #2, Death's Head II (1992 1st Series) #1, Silver Sable and the Wild Pack (1992-1995) #1, Terror Inc. (1992-1993 1st Series) #1, Night Thrasher: Four Control (1992) #1, Darkhold (1992) #1, Nightstalkers (1992-1994) #1, Spider-Man 2099 (1992-1996 1st Series) #1, Venom: Lethal Protector (1993) #1, Cable (1993-2002 1st Series) #1, Deadpool: The Circle Chase (1993) #1, Thunderstrike (1993-1995 1st Series) #1, GAMBIT (1993) #1, War Machine (1994-1996 1st Series) #1, Blackwulf (1994) #1, Force Works (1994-1996) #1, Blade the Vampire Hunter (1994) #1, Generation X Convention Preview (1994), Fantastic Force (1994-1996) #1, Web of Spider-Man (1985-1995 1st Series) #118, Bishop (1994) #1, X-Man (1995-2001) #1, Elektra: Root of Evil (1995) #1, Green Goblin (1995) #1, Captain Marvel (1995 3rd Series Marvel) #1, Heroes for Hire (1997-1999 1st Series) #1, Maverick (1997 X-Men) #1, Quicksilver (1997) #1, Spider-Girl (1998-2006) #1, Slingers (1998) Wizard Edition #0, Spider-Woman (1999 3rd Series) #1, Deathlok (1999 2nd Series) #1 and Warlock (1999 2nd Series) #1; and material from Captain America (1968-1996 Marvel 1st Series) Annual #9, Web of Spider-Man (1985-1995 1st Series) #100, Marvel Comics Presents (1988-1995 1st Series) #147 and 158, and Tales of the Marvel Universe (1997). Revisit comics' most divisive decade with a giant-sized compendium of daring debuts! All your favorites are here: Deadpool! Nomad! X-Force! Scarlet Spider! Quicksilver! ClanDestine! Venom! Nightwatch! Gambit! Vengeance! Spider-Man 2099! 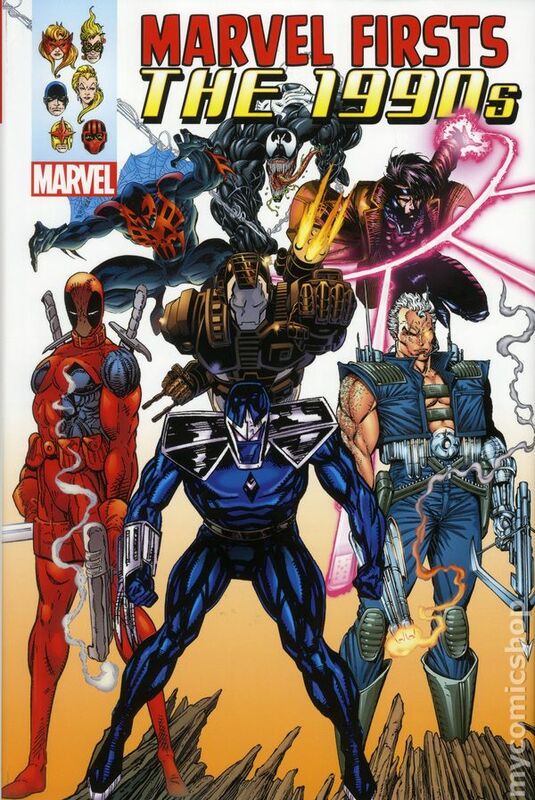 The Thunderbolts! 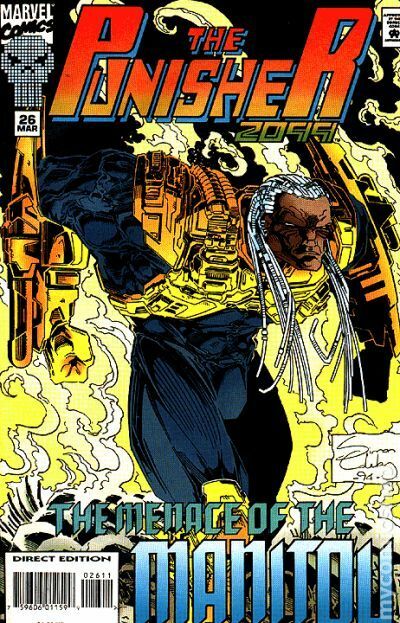 Plus: Ghost Rider and Deathlok, reinvented for the '90s! Guns! Swords! Leather! Clones! Pouches! Don't dis the '90s, they're totally dope! Hardcover, 1,288 pages, full color. BLACK PANTHER #1 Written by Robert Kirkman Penciled by KYLE HOTZ Cover by Pat Lee T'Challa is gone, but Wakanda stands strong. The vibranium mines are still active and it remains one of the richest countries in the world. T'Challa left no heir, and since his passing a succession of Wakandans have attempted to claim the throne. Doctor Doom of Latveria has turned his sights on Wakanda; an invasion is imminent. But where is the Black Panther? 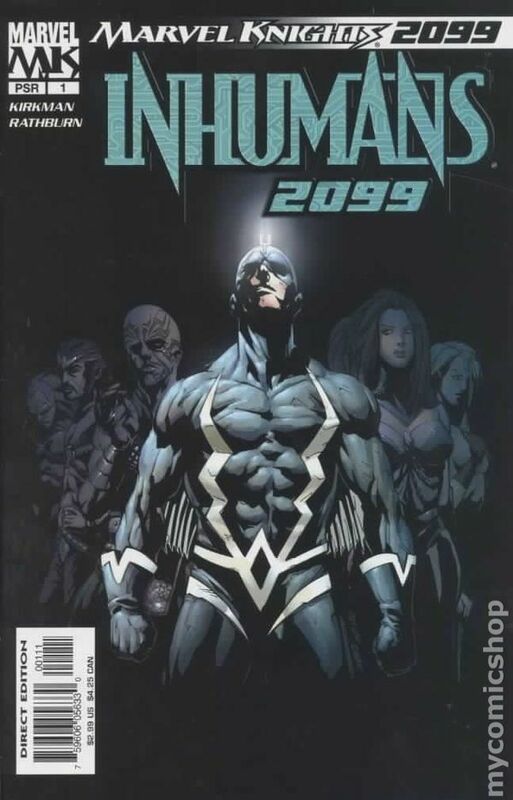 32 PGS./MARVEL PSR ...$2.99 UPC: 5960605631-00111 Cover price $2.99. DAREDEVIL #1 Written by Robert Kirkman. Penciled by Karl Moline and Mike Perkins. Cover by Pat Lee Samuel Fisk carries on his shoulders the burden of a legacy that has lasted over 100 years. He struggles to balance his life with the duty he has accepted in order to continue the works of those that have come before him. Samuel Fisk is Daredevil! 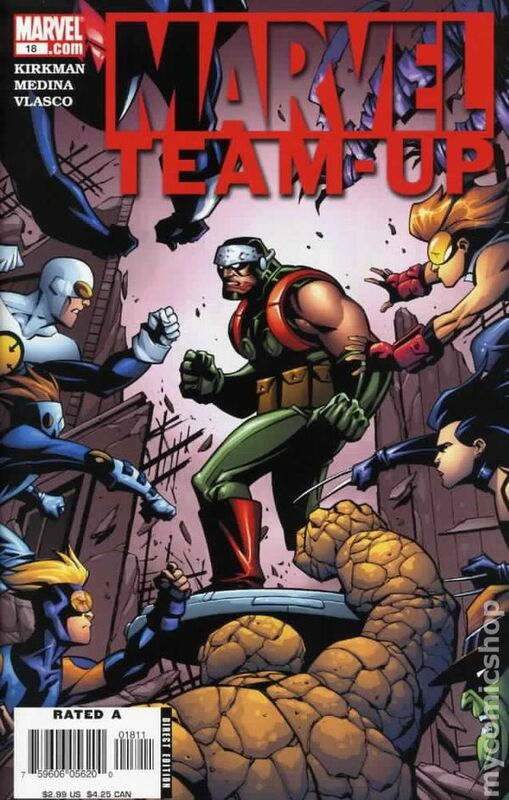 32 PGS./MARVEL PSR ...$2.99 UPC: 5960605629-00111 Cover price $2.99. INHUMANS #1 Written by Robert Kirkman Penciled by CLIFF RATHBURN Cover by Pat Lee After the mutant registration act being reinstated spurred a battle between mutants, super heroes, and the government, it was clear to the Inhumans that anything more than human... was not welcome on Earth. So they left for a life amongst the stars, but after an over-fifty- year journey they have arrived at their destination... but where could they be? 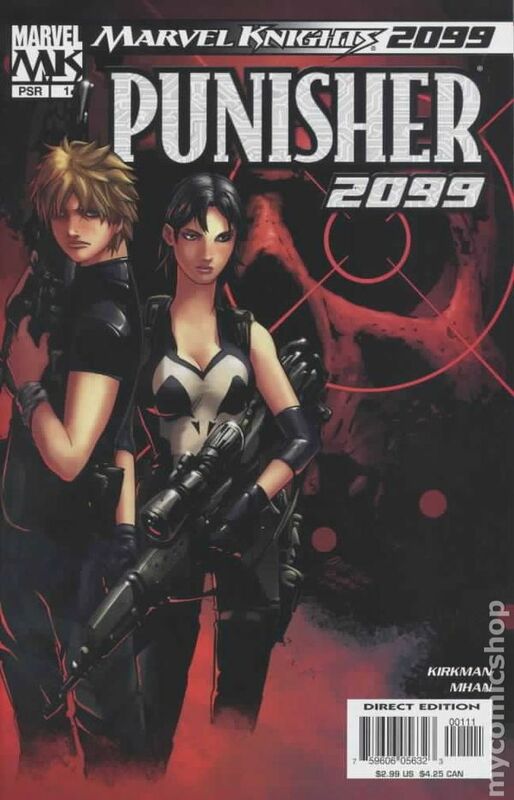 32 PGS./MARVEL PSR ...$2.99 UPC: 5960605633-00111 Cover price $2.99. MUTANT #1 Written by Robert Kirkman Penciled by KHARY RANDOLPH Cover by Pat Lee Registered mutant 2099, Chad Channing, is a mild-mannered high school student at Baxter High. He takes his mutant gene suppression pills every morning and his parents couldn't be more proud of him. With the mutant threat neutralized the world is a safer place, crime is down, a Sentinel is on every corner, and life is pretty much perfect. 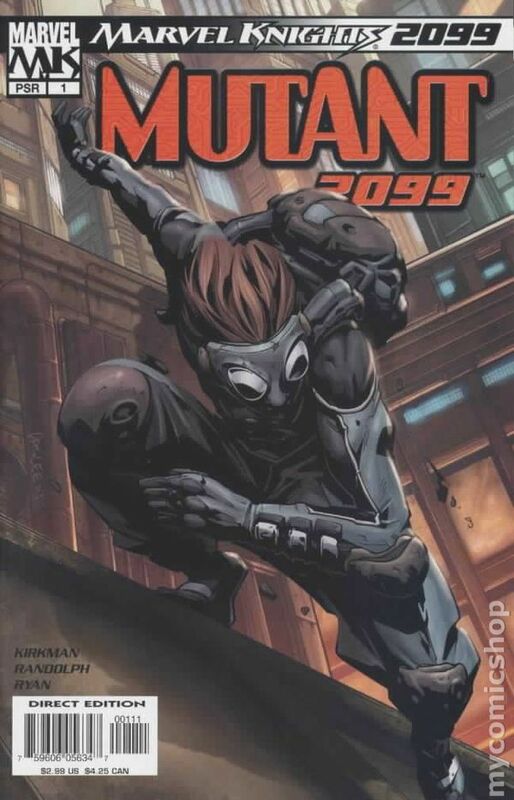 But all that changes when Chad finds a secret basement located under the Baxter Building that houses the living brain of rebel leader Reed Richards. 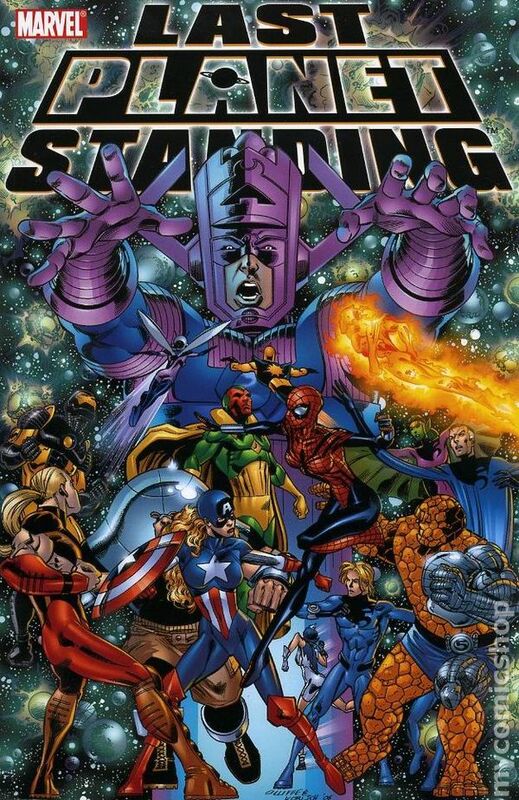 32 PGS./MARVEL PSR ...$2.99 UPC: 5960605634-00111 Cover price $2.99. Written by Robert Kirkman Penciled by POP MHAN Cover by Pat Lee Cassondra Castle is old, her time is coming to an end, but there are still plenty who need punishment. Her son Franklin has never known her terrible secret... he never knew where she spent her evenings... but someone has to pick up the torch... someone has to continue the legacy. Franklin's life is about to change drastically. 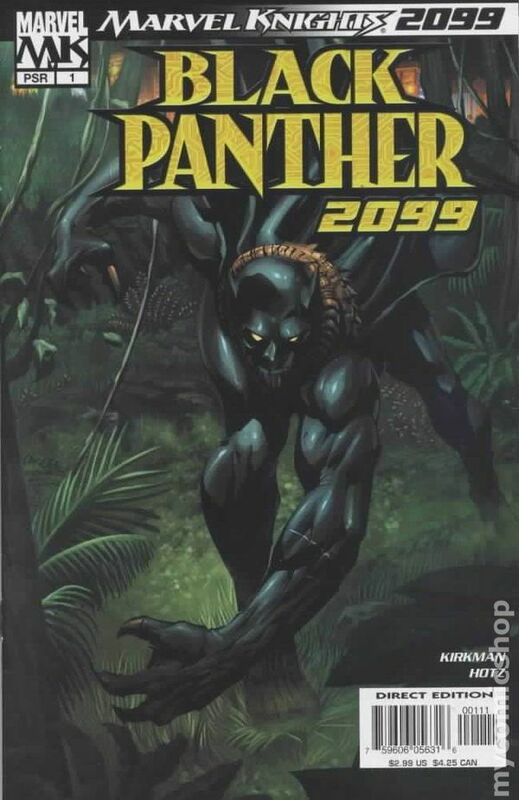 32 PGS./MARVEL PSR ...$2.99 UPC: 5960605632-00111 Cover price $2.99. Written by ROBERT KIRKMAN Penciled by PACO MEDINA Cover by PHIL HESTER. 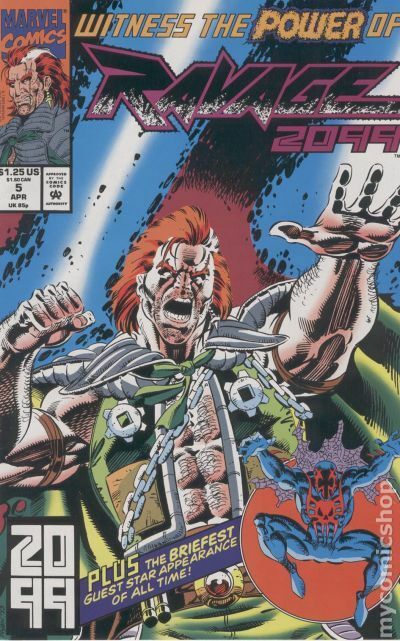 Suddenly from the future comes--MUTANT 2099. In a world without heroes he struggles to save the innocent. 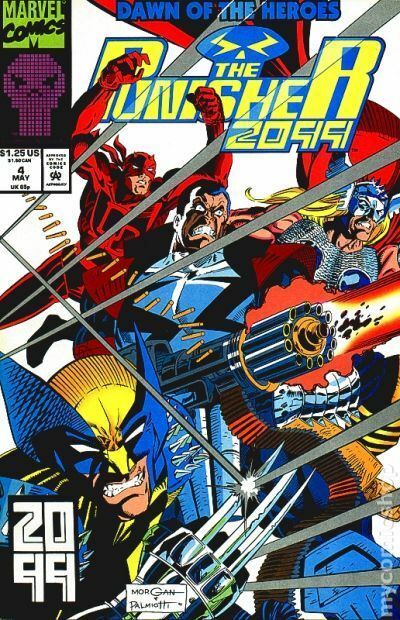 Darkhawk, Sleepwalker, Terror Inc, Speedball, Gravity, Arana, X-23 and Dagger find themselves in the far future. Can they get back in time to save the world--and what role will this strange young mutant play? 32 PGS./RATED A Cover price $2.99. Written by ROBERT KIRKMAN Penciled by PACO MEDINA Cover by PHIL HESTER. Trapped in the future, the LEAGUE OF LOSERS must make the ultimate sacrifice to ensure the survival of the Marvel Universe. Can the losers become heroes before it's too late? Who will live and who will DIE? Featuring GRAVITY! SLEEPWALKER! DAGGER! DARKHAWK! TERROR, INC.! X-23! And SPEEDBALL! 32 PGS./Rated A Cover price $2.99. Foil stamped cover. Cover by Tom Morgan and Jimmy Palmiotti. 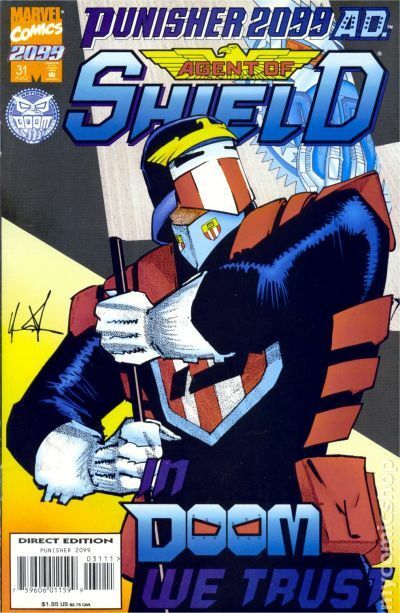 Deadly Genesis, script by Pat Mills and Tony Skinner, art by Tom Morgan and Jimmy Palmiotti; After his family is murdered by the serial killer Kron Stone, Jake Gallows is outraged when Kron is set free with little more then a slap on the wrist due to his social status; Jake is disillusioned by the legal system of his era and then uses the War Journal of Frank Castle as his inspiration, taking up the mantle of The Punisher. 36 pgs., full color. $1.75. 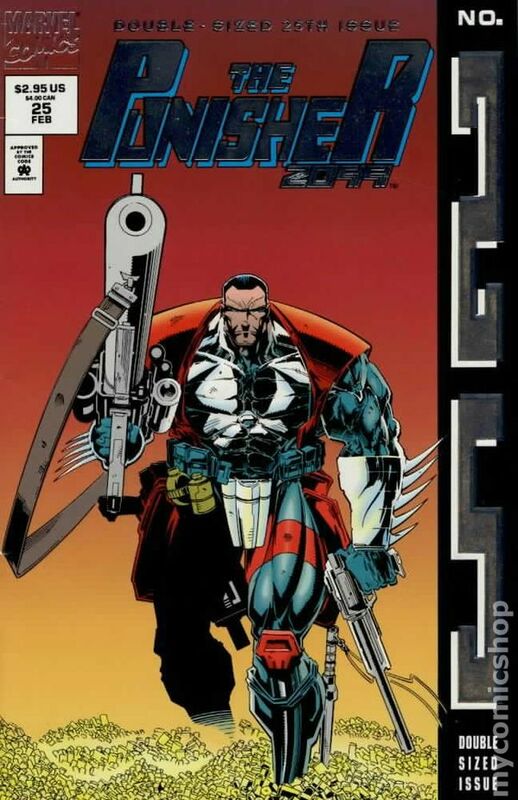 See also Punisher War Journal #50. Cover price $1.75. 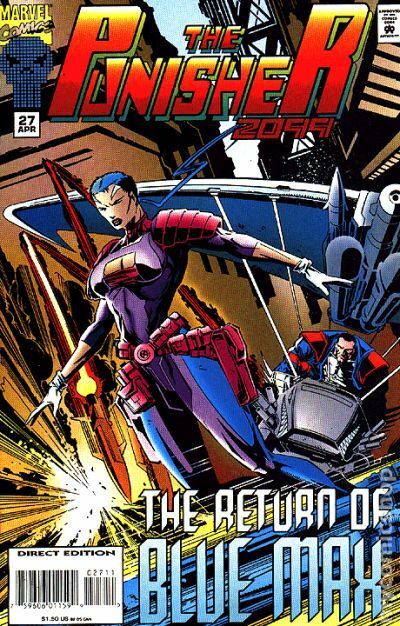 Cover by Tom Morgan and Jimmy Palmiotti. 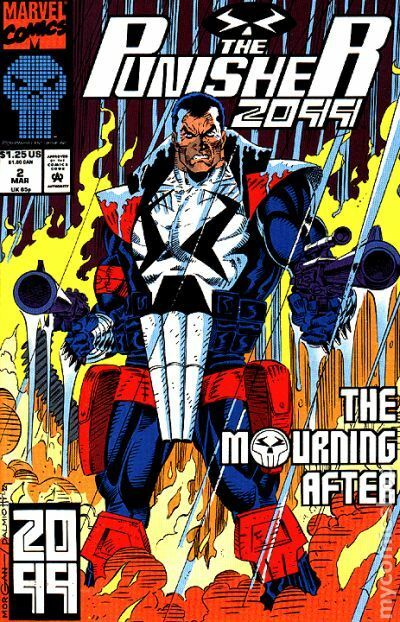 The Morning After, script by Pat Mills and Tony Skinner, art by Tom Morgan and Jimmy Palmiotti; Jake Gallows AKA Punisher 2099 seeks vengeance for the death of his family, targeting Kron Stone and his gang of murderers; Kron wears a device stopping all fast-moving projecticles; he is bulletproof; So Jake Gallows slowly stabs him; Other forces gather to target the new vigilante in town. 36 pgs., full color. $1.75. Cover price $1.25. 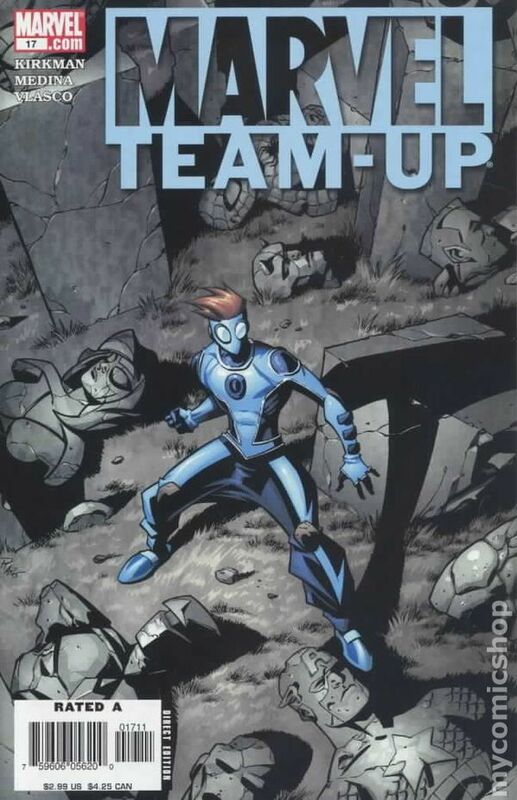 Cover by Tom Morgan and Jimmy Palmiotti. 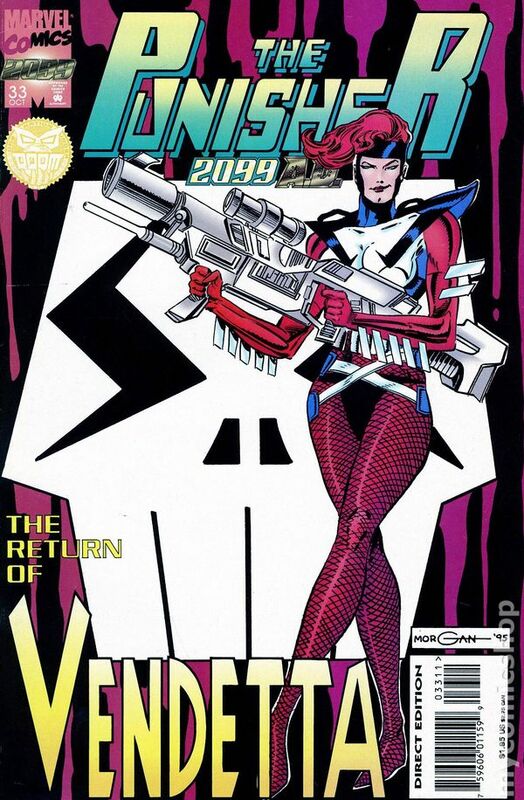 Last Exit From the Bronx, script by Pat Mills and Tony Skinner, art by Tom Morgan and Jimmy Palmiotti; Punisher stops the dealer who was selling illegal virtual reality discs and takes him to the Punishment Hotel where decides to imprison him for 20 years; Later at work Punisher finds out that the girl who was buying virtual reality discs jumped off the bridge and died while being under their influence; The Punisher heads back to the Punishment Hotel and changes the sentence from 20 years to execution. 36 pgs., full color. $1.25. Cover price $1.25. Cover by Tom Morgan and Jimmy Palmiotti. 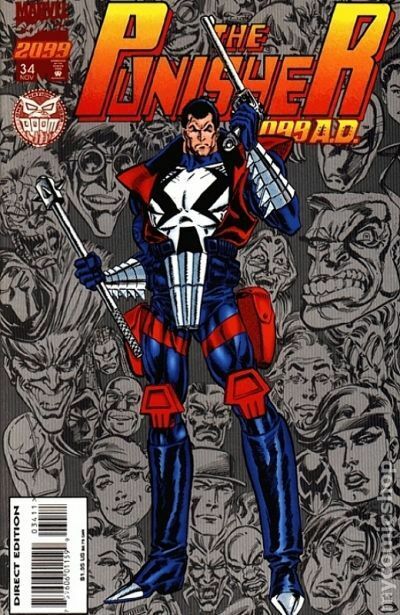 Heroes Day, script by Pat Mills and Tony Skinner, art by Tom Morgan and Jimmy Palmiotti; The Punisher helps a neighborhood besieged by violent forces; The local vigilante dies; The Punisher mourns until the mask is picked up by another and the hero lives on. 36 pgs., full color. $1.25. Cover price $1.25. Cover by Tom Morgan and Jimmy Palmiotti. 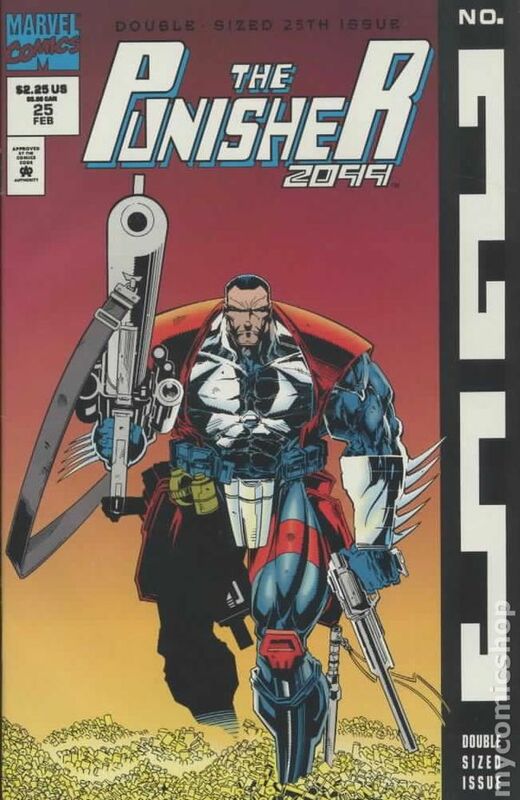 Punishment Hotel, script by Pat Mills, Tony Skinner, art by Tom Morgan and Jimmy Palmiotti; The jail the Punisher set up has a break-out. 36 pgs., full color. $1.25. Cover price $1.25. 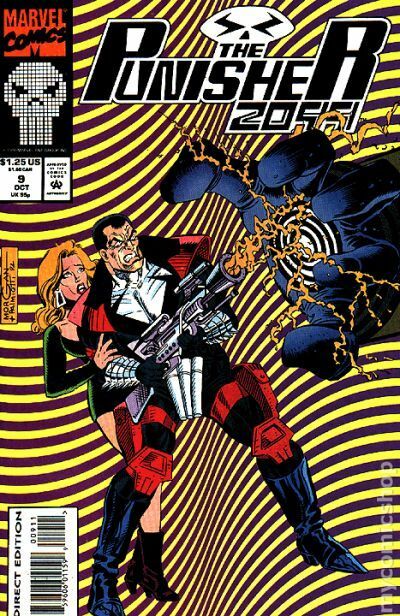 Cover by Tom Morgan and Jimmy Palmiotti. 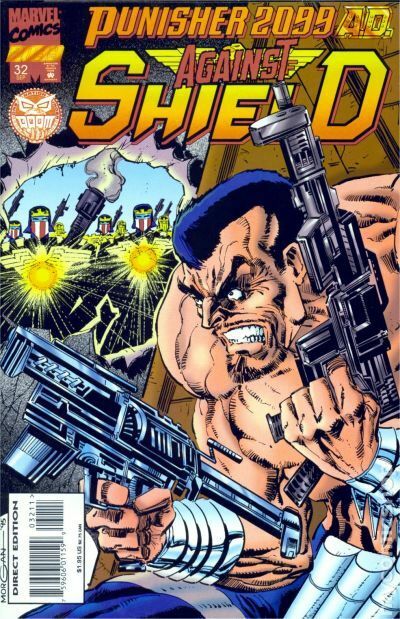 Techno Gladiators, script by Pat Mills and Tony Skinner, art by Tom Morgan and Jimmy Palmiotti; The Punisher battles Multi-Fractor rages on; Punisher gets the best of Multi-Fractor at first, but corrupt cops help Multi-Fractor; Matt Axel helps Punisher defeat Multi-Fractor; Matt takes control of Punisher's suit and shoots the cops; Punisher blames Frearmaster for making him cross that line. 36 pgs., full color. $1.25. Cover price $1.25. Love and Bullets: Part 1 of 3: Confession - Written by Pat Mills & Tony Skinner. Art & Cover by Tom Morgan & Jimmy Palmiotti. A mysterious relationship develops between Jake Gallows and Kerry, the psychiatrist sent to investigate him! 32 pages, full color. Cover price $1.25. Love and Bullets: Part 2 of 3: Passion - Written by Pat Mills & Tony Skinner. Art & Cover by Tom Morgan & Jimmy Palmiotti. Spider-Man 2099's Tyler Stone guest stars! Jake finds a new reason for living...and the Fearmaster has found a new reason for killing! 32 pages, full color. Cover price $1.25. Love and Bullets: Part 3 of 3: Requiem - Written by Pat Mills & Tony Skinner. 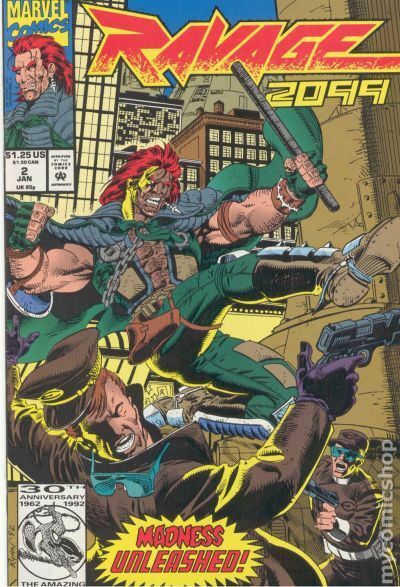 Art by Tom Morgan, Jimmy Palmiotti and Thomas Florimonte, Jr. Cover by Tom Morgan & Jimmy Palmiotti. The only relationship Jake Gallows has had since the brutal death of his family is shattered! 32 pages, full color. Cover price $1.25. 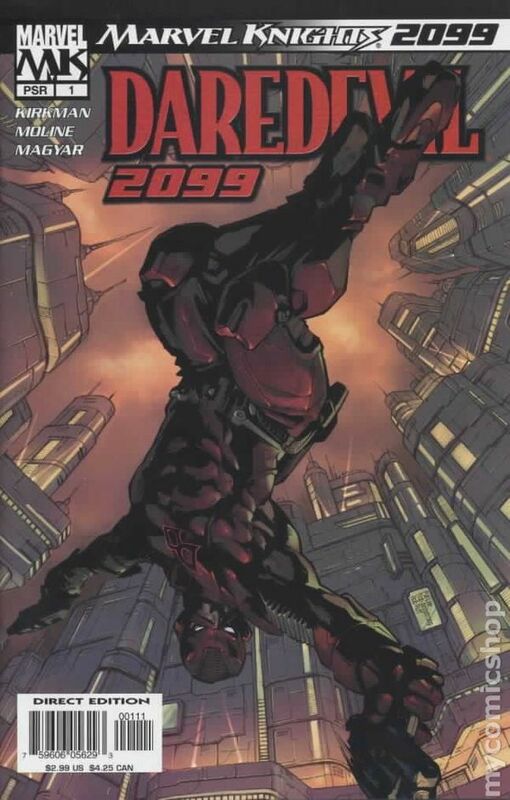 Jigsaw 2099 - Written by Pat Mills & Tony Skinner. Art by Tom Morgan & Jimmy Palmiotti. Cover by Tom Morgan, Jimmy Palmiotti and Thomas Florimonte, Jr. When Jake suffers a tragic loss, he struggles to pick up the pieces! But, because what doesn't kill us only makes us stronger, expect ol' Jake to use his rage to fuel a frenzied campaign against crime! 32 pages, full color. Cover price $1.25. The Gathering Storm - Written by Pat Mills & Tony Skinner. 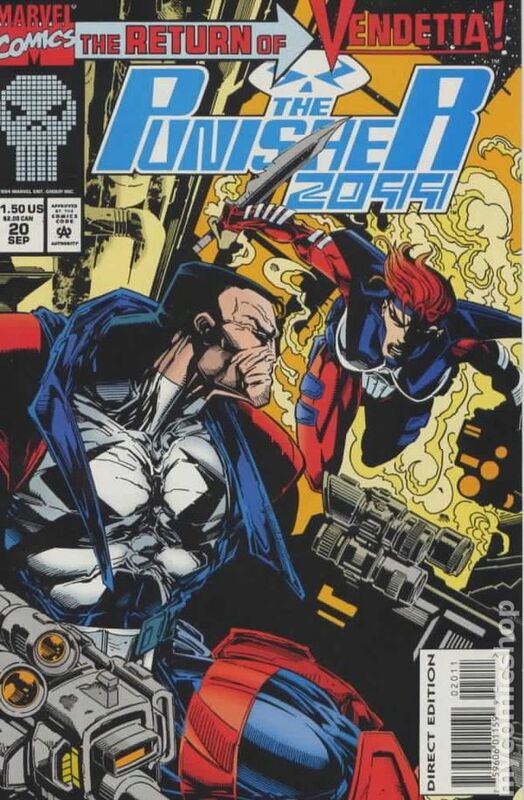 Art by Tom Morgan, Jimmy Palmiotti and Thomas Florimonte, Jr. Cover by Tom Morgan & Jimmy Palmiotti. 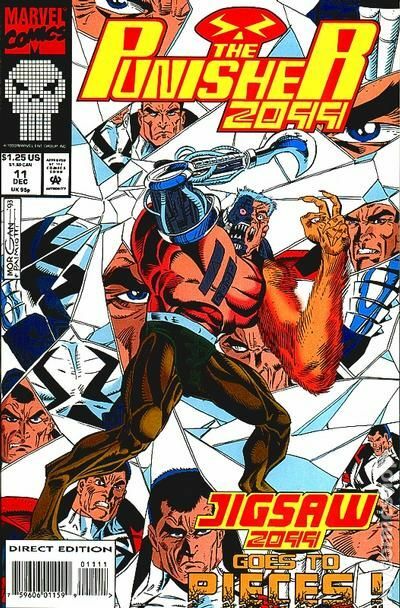 Jigsaw 2099 goes to pieces! 32 pages, full color. Cover price $1.25. Hard Sky - Written by Pat Mills & Tony Skinner. Art by Art Nichols & John Nyberg. Cover by Grant Miehm. The crown jewel in the sky, the city of Valhalla is rocked from its moorings. The resulting effects are utter chaos! These events lead up to next month's huge crossover involving all the 2099 titles. 32 pages, full color. Cover price $1.25. THE FALL OF THE HAMMER: Part 5 of 5. All for One - Written by Pat Mills & Tony Skinner. Art by Tom Morgan & Jimmy Palmiotti. Cover by Ron Lim. 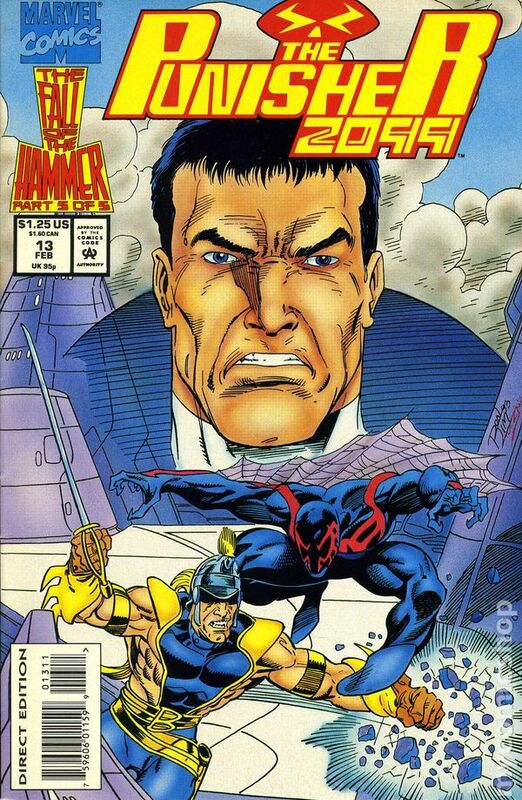 In the conclusion to the first-ever 2099 crossover, Spider-Man 2099 teams up with Jake Gallows to save the doomed city of Valhalla! And what is the fate of the New Asgardians? 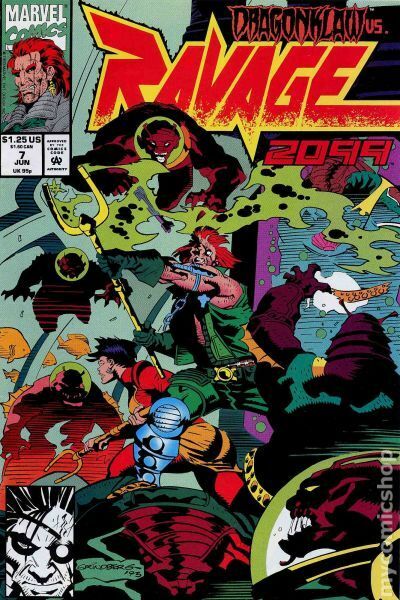 Also featuring appearances by Doom 2099 and Ravage 2099. 32 pages, full color. Cover price $1.25. Young Blades - Written by Pat Mills & Tony Skinner. Art by Will Simpson. Cover by Joe Kubert. Is the Punisher going mad? Jake loses control of himself, vowing to take his mission of retribution more seriously than ever! 32 pages, full color. Cover price $1.25. The Public Enemy File: Part 1 of 3: Red Dog Day - Written by Pat Mills & Tony Skinner. Art by Tom Morgan & Keith Williams. Cover by Tom Morgan. Don't miss the showdown between the Punisher and the Fearmaster! This conflict has been building for a while now, and the fight was worth the wait! 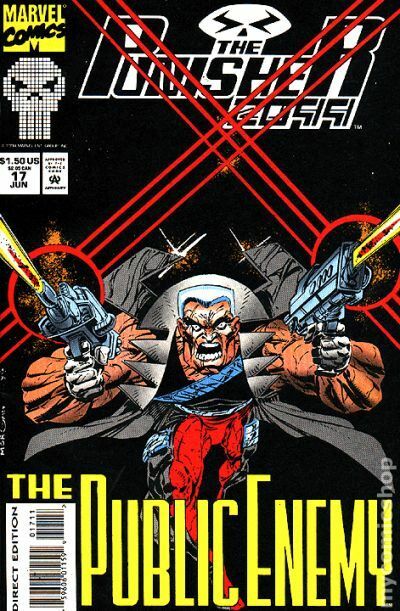 Also in this issue is a brand new villain, the Public Enemy, who's in the middle of a killing spree! 32 pages, full color. Cover price $1.25. Includes trading cards. The Public Enemy File: Part 2 of 3: Silence of the Sheep - Written by Pat Mills & Tony Skinner. Art by Tom Morgan & Keith Williams. Cover by Tom Morgan. 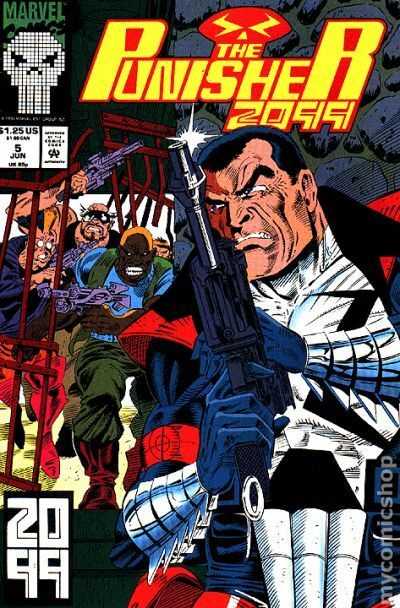 The Punisher 2099 is armed and dangerous when he straps on a new limb -- a cybernetic arm with enough firepower to destroy a military base! Secrets about weapon master Matt Axel's shadowy past are revealed! 32 pages, full color. Cover price $1.50. The Public Enemy File: Part 3 of 3: Shopping Maul! - Written by Pat Mills & Tony Skinner. Art by Tom Morgan & Keith Williams. Cover by Tom Morgan. 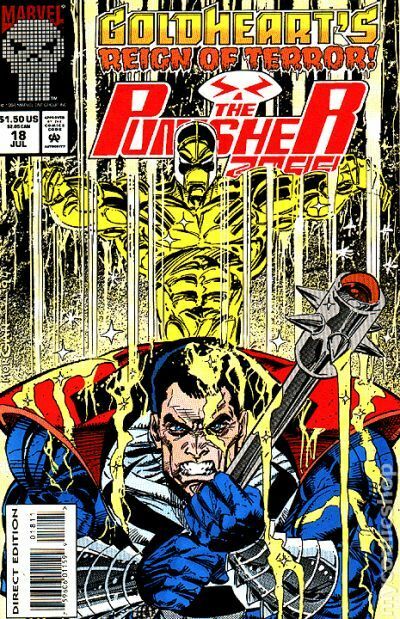 The Punisher takes on an all-new villain whose inhuman strength and gold plated armor make him virtually invincible. Is the Punisher committing suicide when he sets out to stop him? Appearances by Goldheart and the Public Enemy. 32 pages, full color. Cover price $1.50. Armed and Dangerous - Written by Pat Mills & Tony Skinner. Art by Tom Morgan & Keith Williams. Cover by Tom Morgan. Goldheart's reign of terror! Cop Jake Gallows is assigned a new partner. 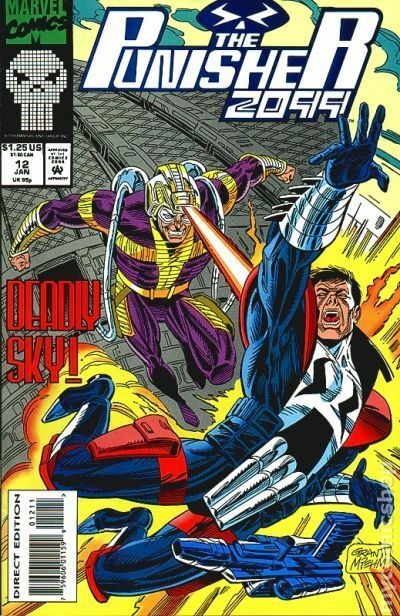 Boy, is he teed off when he learns it's none other than the killer he fought last month as his alter ego, the Punisher! 32 pages, full color. Cover price $1.50. Deadlier than the Male - Written by Pat Mills & Tony Skinner. Art by Simon Coleby & Keith Williams. Cover by Simon Coleby. Incredible artist Simon Coleby jumps on as new regular penciler. Unfortunately, Simon may not have a main character to draw once Vendetta gets through with the Punisher! 32 pages, full color. Cover price $1.50. Sins of the Father - Written by Pat Mills & Tony Skinner. Art by Simon Coleby & Keith Williams. Cover by Simon Coleby. 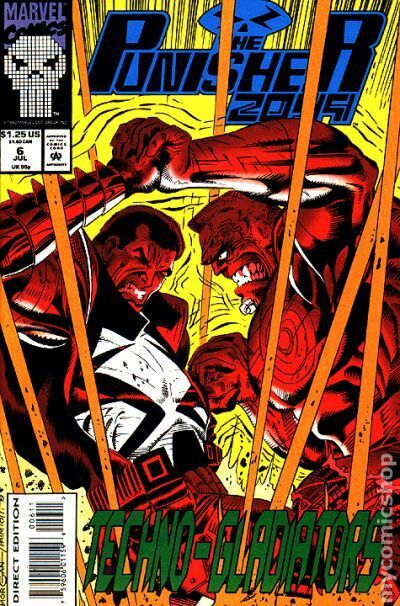 It's the final explosive showdown between the Punisher and Hotwire! It's father against son as Jake may have to kill his own flesh and blood to survive! 32 pages, full color. Cover price $1.50. Ghost in the Machine! - Written by Pat Mills & Tony Skinner. Art by Simon Coleby & Keith Williams. Cover by Simon Coleby. Jake takes on Hotwire, plus it's the explosive debut of the Punisher's most powerful adversary: Synchron! 32 pages, full color. Cover price $1.50. Fatal Attraction - Written by Pat Mills & Tony Skinner. Art and Cover by Simon Coleby. The Punisher meets Synchron in a reality-shattering battle that will leave you reeling! This issue leads to the incredible events occurring next issue! 32 pages, full color. Cover price $1.50. 52-page giant; Embossed foil cover. 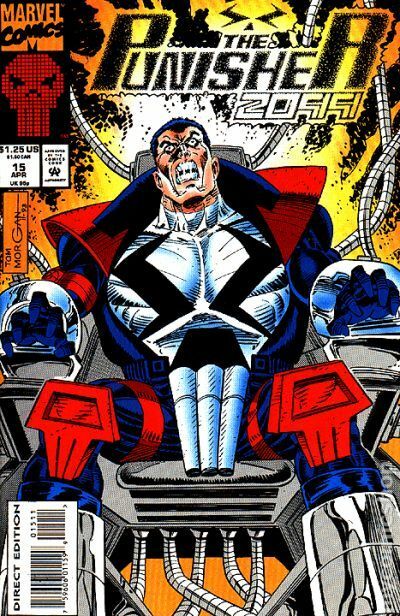 The Punisher of 2099 celebrates his 25th big issue! There's no stopping a Punisher-gone-crazy! 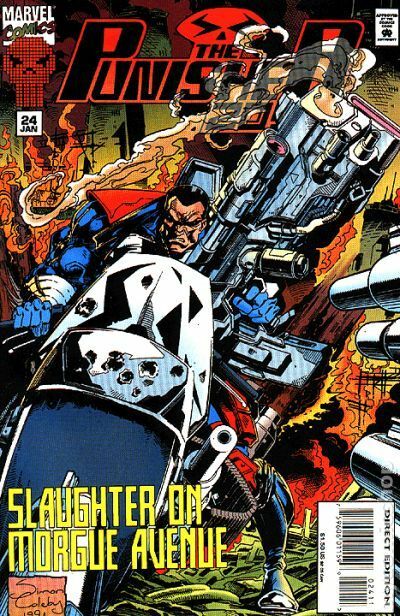 After falling under the spell of a techno-assassin, the Punisher embarks on a frenzied carnage spree. Written by Pat Mills and Tony Skinner. Art by Simon Coleby, Luke Ross, Tom Morgan, Scott Koblish and Keith Williams. Cover price $2.95. 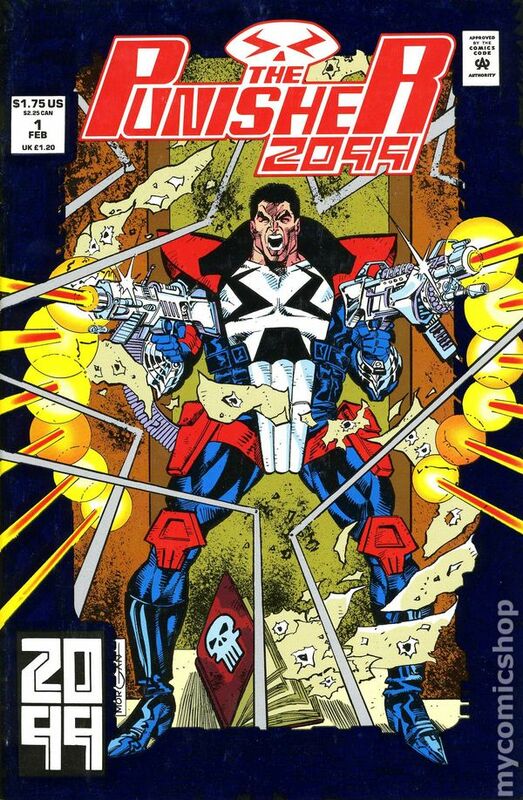 The Punisher of 2099 celebrates his 25th big issue! There's no stopping a Punisher-gone-crazy! 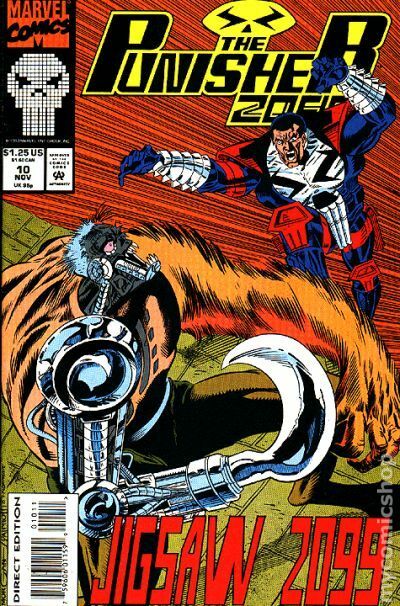 After falling under the spell of a techno-assassin, the Punisher embarks on a frenzied carnage spree. 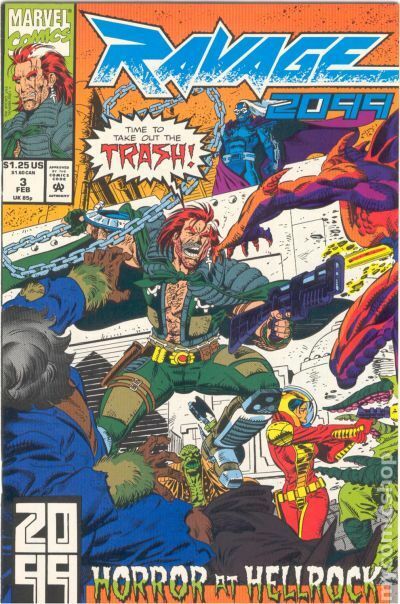 Written by Pat Mills and Tony Skinner. Art by Simon Coleby, Luke Ross, Tom Morgan, Scott Koblish and Keith Williams. Cover price $2.25. Suicide Run - Written by Pat Mills & Tony Skinner. Art by Joe Bennett & Scott Koblish. Cover by Simon Coleby. Don't miss the big showdown between Jake and the Manitou! The city is on its knees and the police are helpless to save it. 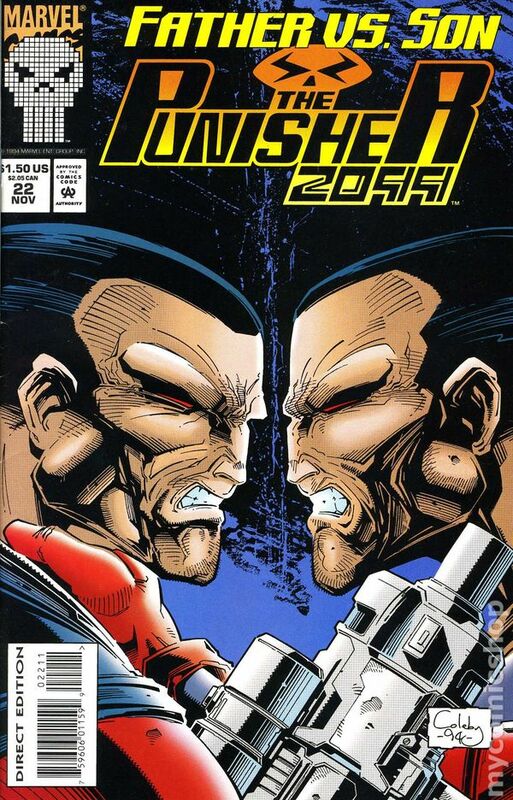 Can the Punisher defeat the Manitou before he takes the whole metropolis down? 32 pages, full color. Cover price $1.50. The Blue Dagger - Written by Pat Mills & Tony Skinner. Art by Will Simpson. Cover by Simon Coleby. The return of Blue Max! 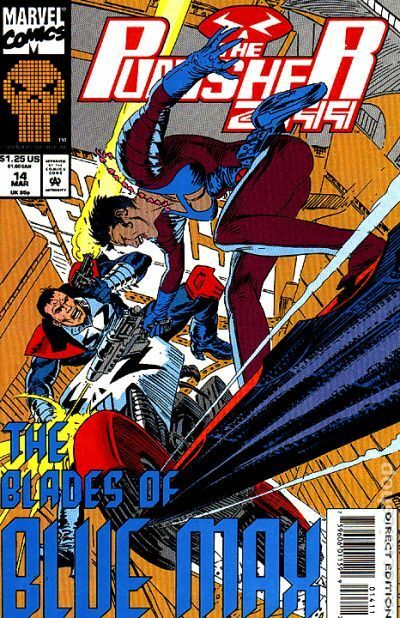 The Punisher thought the flying skateboarder died in issue #14...but she and her deadly young blades gang are back and cruisin' for a bruisin'! 32 pages, full color. Cover price $1.50. ONE NATION UNDER DOOM. Truth and Lies - Written by Pat Mills & Tony Skinner. Art by Simon Coleby, Brad Vancata and Hector Collazo. Cover by Simon Coleby. 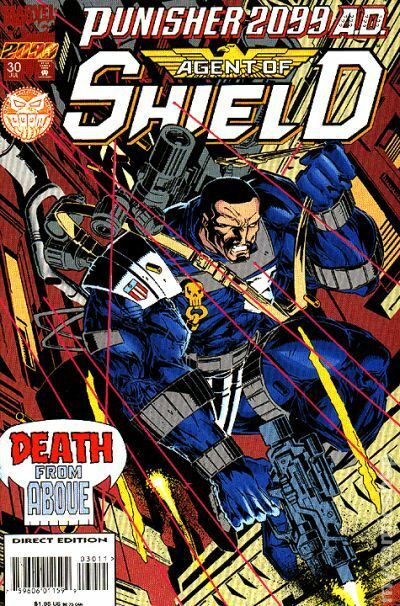 The Punisher becomes Jake Gallows: Agent of SHIELD! As the "Minister of Punishment," Gallows will make them all suffer. 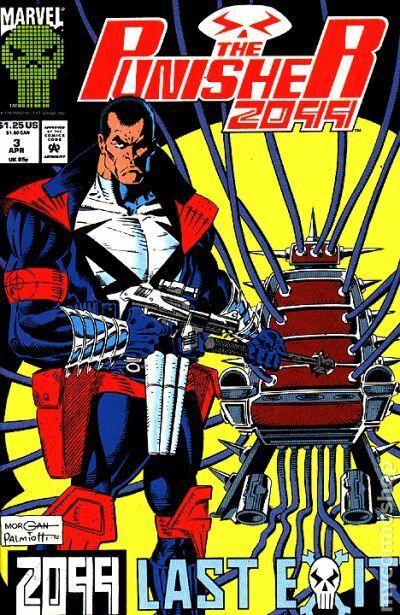 But who will replace the Punisher? Major changes are in store this issue! 32 pages, full color. Cover price $1.95. ONE NATION UNDER DOOM. Playing God - Written by Pat Mills & Tony Skinner. Art by Enrique Villagran. Cover by Simon Coleby. Doom names Jake Gallows his Minister of Punishment, giving Gallows the power to dispense justice as he sees fit! 32 pages, full color. Cover price $1.95. ONE NATION UNDER DOOM. Deadly at the Top - Written by Chuck Dixon. Art by Rod Whigham & Enrique Villagran. Cover by Simon Coleby. Doom's Minister of Punishment is out of control! That is, until a new Punisher arrives to take Jake Gallows down! 32 pages, full color. Cover price $1.95. ONE NATION UNDER DOOM. 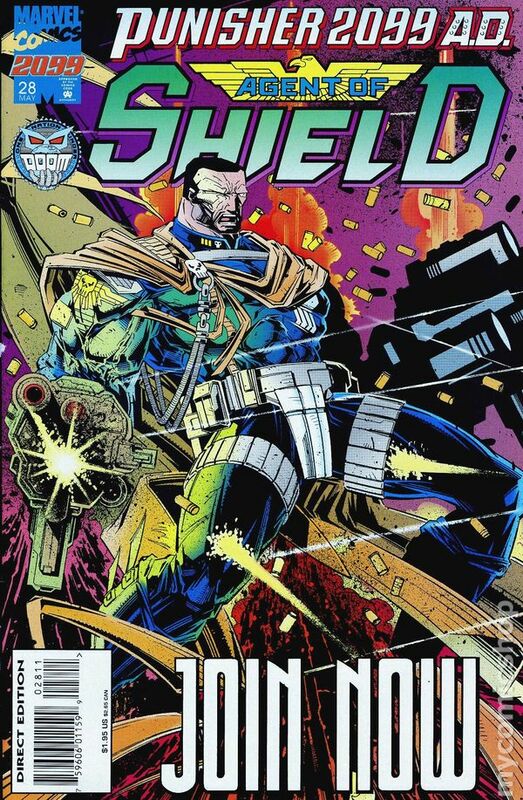 Flesh and Steel - Written by Chuck Dixon. Art by Rod Whigham & Enrique Villagran. Cover by Howard Chaykin. 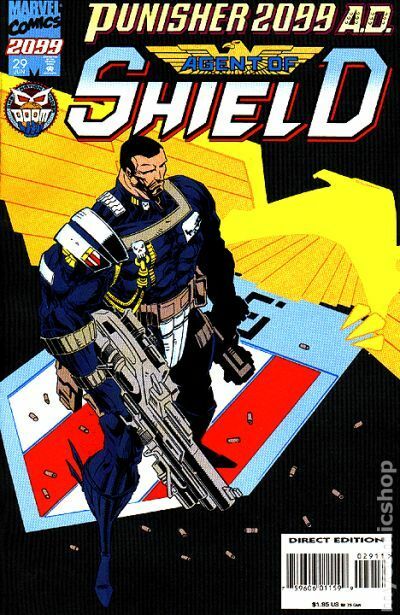 Jake Gallows: corrupt Agent of SHIELD? With Jake's personal fall imminent, will Doom take matters into his own iron-plated hands? 32 pages, full color. Cover price $1.95. ONE NATION UNDER DOOM. Gravity Bites - Written by Chuck Dixon. Art by Rod Whigham & Enrique Villagran. Cover by Tom Morgan. 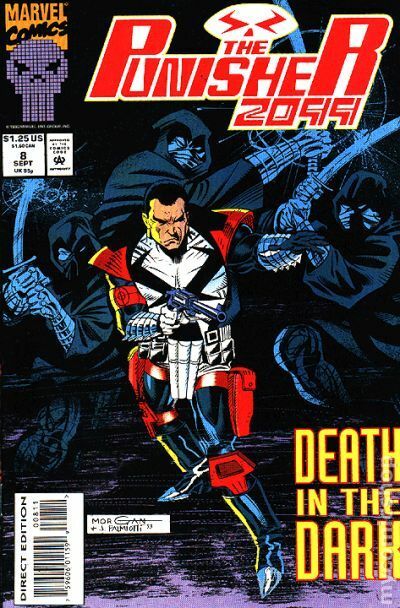 The Punisher 2099's own countdown begins! Doom and SHIELD close in as Jake runs out of ammo! 32 pages, full color. Cover price $1.95. ONE NATION UNDER DOOM. 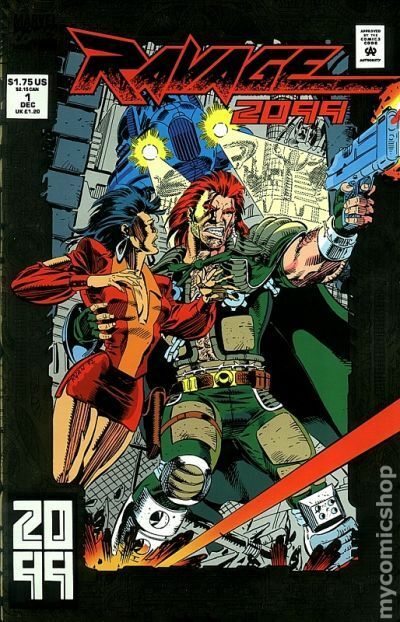 The Blue Star - Written by Chuck Dixon. Art by Rod Whigham & Enrique Villagran. Cover by Tom Morgan. 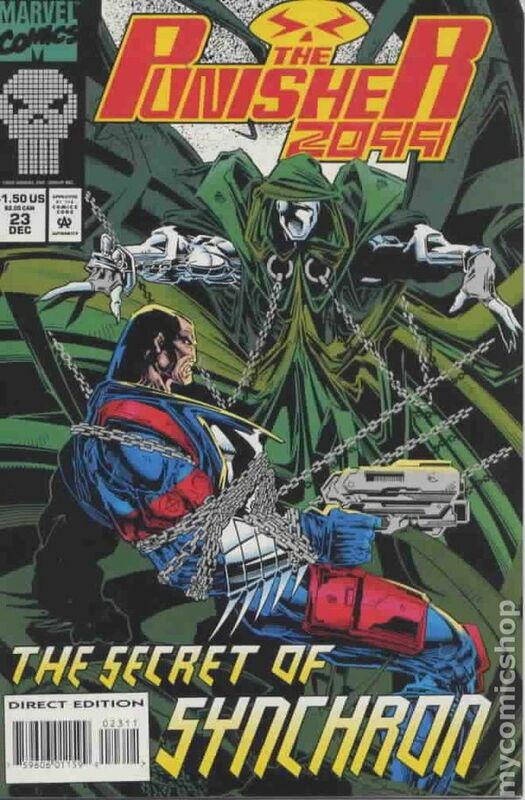 It's the return of Vendetta as the Punisher 2099's own countdown continues! 32 pages, full color. Cover price $1.95. ONE NATION UNDER DOOM. The Stars are Skulls - Written by Chuck Dixon. Art by Rod Whigham & Enrique Villagran. Cover by Tom Morgan. Final fatal issue! Punisher is on the run for his life, leaving death in his wake! The countdown hits zero as the noose closes around Gallows' neck! 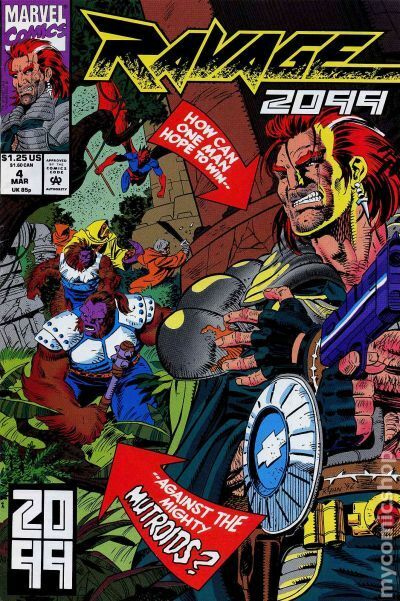 This blow-out leads directly into 2099 Apocalypse (1995) #1! 32 pages, full color. Cover price $1.95. Paul-Phillip Ravage, commander of Eco Central, takes it seriously when a young man claims his father was killed by Eco agents while attempting to expose the pollution hierarchy in this untitled tale. Script by Stan Lee, pencils by Paul Ryan, inks by Keith Williams, inks assists by Steve Alexandrov. Gold foil stamped cover by Ryan. 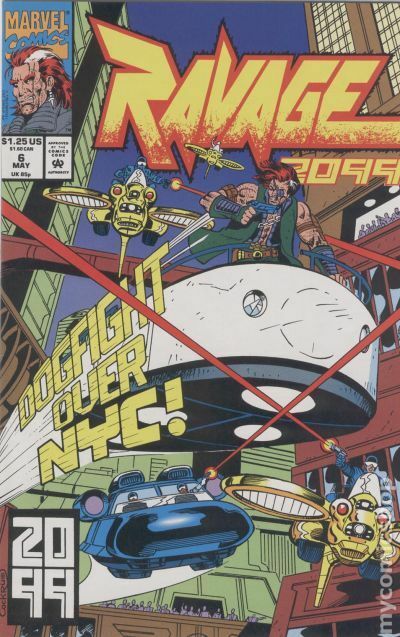 Also see Marvel Comics Presents (1988-1995 1st Series) #117 for a Ravage 2099 tale. Cover price $1.75. This Madness Unleashed! - Written by Stan Lee. Art by Paul Ryan & Keith Williams. Cover by Paul Ryan. The corporate forces of ECO lash out at Ravage by ordering Dethstryk to kill Tiana and Dack, the only people Ravage trusts! 32 pages, full color. Cover price $1.75. Horror in Hellrock! - Written by Stan Lee. Art by Paul Ryan & Keith Williams. Cover by Paul Ryan. Ravage must go where no human has dared set foot...the Mutroid's murky isle known as Hellrock! Now, Ravage not only has to worry about Dethstryk, but if he stays on Hellrock too long...he risks becoming a Mutroid himself! 32 pages, full color. Cover price $1.25. The Mark of the Mutroid! - Written by Stan Lee. Art by Paul Ryan & Keith Williams. Cover by Paul Ryan. Is Ravage destined to become a Mutroid? Even if he can rescue Tiana in time, he's trapped on Hellrock with nowhere to run! 32 pages, full color. Cover price $1.25. With These Hands! - Written by Stan Lee. Art by Paul Ryan, Keith Williams and Bud LaRosa. Cover by Paul Ryan. Ravage's life is changed forever when he's caught between the world of Hellrock and the world he has sworn to defend! 32 pages, full color. Cover price $1.25. The Power and the Peril! - Written by Stan Lee. Art by Paul Ryan, Keith Williams and Bud LaRosa. Cover by Dave Cockrum. Can Ravage adjust when his body chemistry is dramatically altered? Is this transformation only the first? 32 pages, full color. Cover price $1.25. The Vengeance of Dragonklaw! - Written by Stan Lee. Art by Paul Ryan & Keith Williams. Cover by Tom Grindberg. Ravage acquires a super power, but at what price? Uncertain that he can control it, Ravage fears he'll never again walk among normal men! 32 pages, full color. Cover price $1.25.